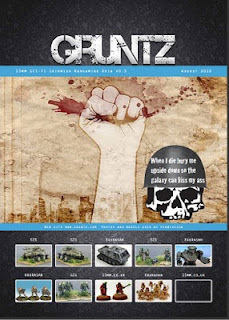 I have written a SCI-FI skirmish rule set in 15mm called "GruntZ" and I am looking for some beta test and volunteer support to help turn the draft into a final product. It is written directly for 15mm, rather than a shrunken 28mm game and provides full scope for combined arms using vehicles, squads, aliens and drone / automaton technology. It is a simple fast play turn based system with a focus on adding interest to the game through the special abilities and unique technology used by various factions. 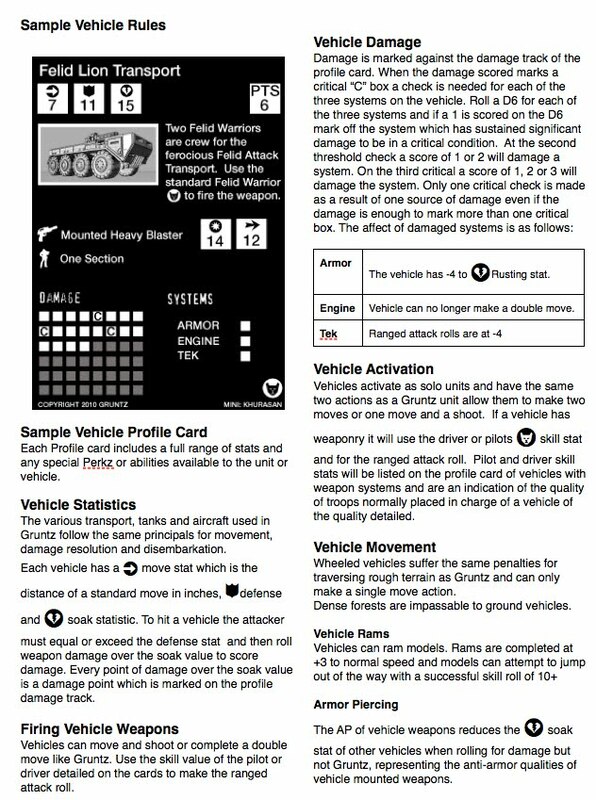 Each squad and vehicle will have its own profile card which will depict the model and explain the special rules that relate to it. At this stage I have approval from two main 15mm SCI-FI miniature companies to use their factions and figures in the system which will allow me to create some clear rules for the most popular 15mm SCI-FI miniatures. If you have the time and energy to help out and want to try them for yourself please comment on the blog here and I will make contact. I am an avid 15mm sci-fi gamer, so these rules I think will work great for our group to try. Any chance I can take a look? Sorry but I can't playtest them - I didn't bring any lead with me here to Iraq, but I do work with 2 other gamers! I can pass the rules around for some feedback. Awesome web site, BTW. Oh - and I've got Narcissus envy. I am very interested in this project and would love to get involved. This would be an ideal way to focus some energy into my neglected collection of 15mm goodness. Liked the video and would like to try out the rules. Wondering if they can be used with larger miniatures. Contac me at herc.warrior@gmail.com. Thanks. Thanks for the recent requests for playtest. Rules will be with you on Tuesday. Just updating another release tonight. I'd love to take the rules for a spin! I'd love to pitch in and help however I can. Hi, I'd like to give the rules a whirl please. A friend told me about your game this afternoon and I would like to be able to playtest the rules for you. We have a fairly good group here and are into quite a few genres. There is a current push towards 15 mm games so this find is rather good timing. Thanks a bunch and I look forward to trying it out. I would be keen to pitch in as much as I can. I've been looking to make the jump to 15mm sci-fi from 15mm historical stuff. I was looking at your terrain from old crow. I was thinking about getting the starter set. How much more did you get to make that base? In total it was over £120 for the full set. If you wanted just a small area on a couple of 30x30cm board layouts you might get away with around £50 of tiles. Note that you should really build around the 3cm size of individual tiles. Thats why I based on 30x30 boards using "no more nails" glue. If you're still after playtesters, I'd be interested! I'll giev it a try at our next wargames club meeting. Hirst Arts (www.hirstarts.com) produce a Star Wars themed "Starship Wall" mould which is ideal for 15mm scale if you turn the wall sections on their sides. It's about £25 for the mould, but plaster is pretty cheap and you can cast vast quantities of scenery for not much money. They do a nice cargo bay mould too, with a great set of cargo doors. Would love to get a copy of the rules we have a nice size gaming club and have been trying to convert them to 15mm Sci-Fi you stuff looks great. I definetly want to look and playtest the rules. I'd love to have a go, and provide comments. 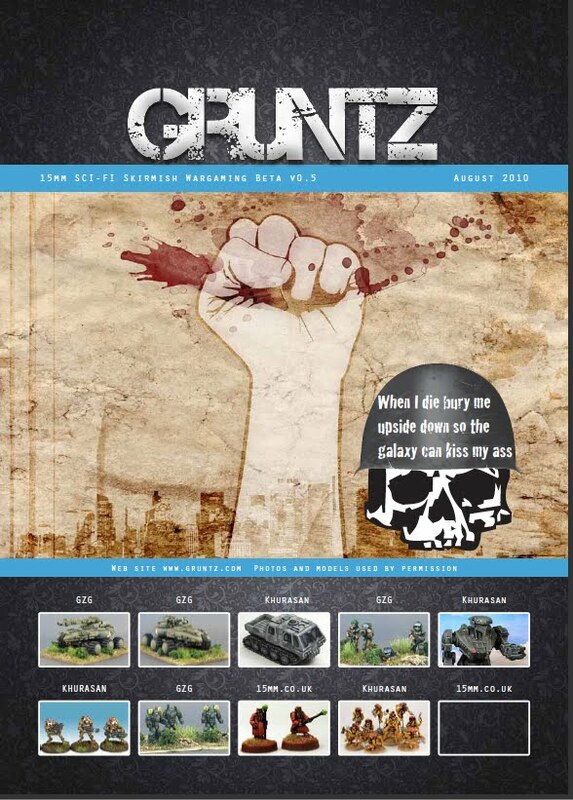 My group's looking for a skirmish game and Gruntz was recommended... I'd be interested in a beta copy if one's available, and we'll happily feed back / blog the battle reports. Woud love to give these rules a go! Drop me a line ASAP! Thanks! would very much like to try out the ruleset.